The memory card goes into the computer already in the forest. Teacher Janek Joab checks on the spot who have passed the camera this time? Over 10 schools have responded to the appeal from the Animal of the Year Team to school classes to set up trail cameras in the forest. Among them are also schools in the countryside and small towns. Teacher Janek Joab from the Antsla Gymnasium tells us why the children need trail cameras. Janek, do the children in the Antsla school have any use of a trail camera in the forest – after all everyone believes that children in rural areas and small towns know nature better than a city child? Country children too need help in learning to know nature because they too are quite urbanized today and not very keen on going for instance into the forest. Throughout the whole society, including the countryside, lifestyle has become focused on indoors and computers and easy-going comfort. 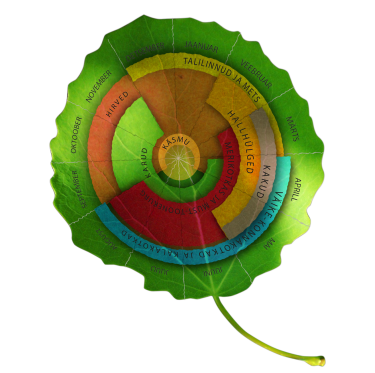 Finding information is just a few clicks away for children. It is vital here to teach them to notice and to know real nature. Children of today are quite home-based, there are very few who get around in nature on their own initiative. They all need signposts. The first camera harvest for the children: Two little roe deer. What are you hoping to teach the children with this camera? This little technical widget is a real lure for the children. Just with a plain ”let us go to the forest” call only a very few would come. In this present age of technology we must keep in mind that the aids to learning are quite different. I think that following the camera helps the children to understand that here, actually only half a kilometre away from school, forest life goes on. The animals are around us and really exist, not only as images in internet. Their eyes light up when they see photos of many different creatures. They get a reason and an interest to go into the forest. The most enthusiastic ones start to carry food to the animals and not only during the nature circle time but on weekends too. What have the children said about what they want to see in the camera? On our way to the forest we have always guessed at who might have been caught in camera view during the week. The first expectation of the children is to see an elk, and the more enthusiastic also hope to see a bear in an image. But when we look at the images every animal that has been caught by the camera fires their passion. Be it then a roe deer or raccoon dog. Eyes light up. They are always in a fever of anticipation. It surprised me that there were so may who were interested in our school and it seems to me that this is also an activity that is very different from the regular circles in the school. This is the perfect solution for attracting children outdoors. One idea was to put up a salt lick for the animals. To start with a dried tree had to be felled in the forest. .....and then forced into the ground. 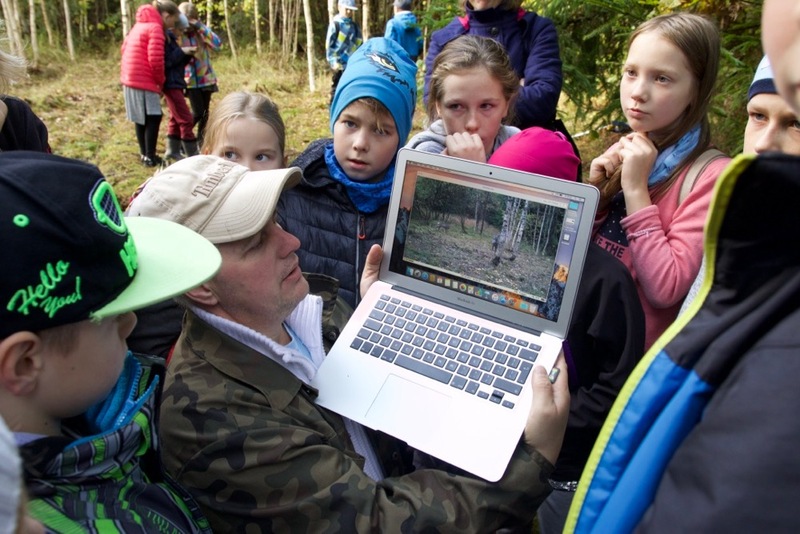 At the moment the Antsla Gymnasium trail camera project has been joined by the Tsirguliina Secondary School, Varstu School, Ala Elementary School, Keeni Elementary School, Kosejõe and Nurme Schools; in the near future more participants will join, in addition to the Tallinna Vaba Waldorf School, Ridala Elementary School and Võru Kreutzwald School that joined in spring. We certainly look forward to participation also from schools in large cities. Together we will find a solution for a place to install the camera! Until then we welcome the best images and stories from the schools that already have joined. Exciting – who has been here? The Team of the Animal of the Year with the children of the Antsla Gymnasium installing the camera in the forest.